Batman fans know Batman has always had the coolest tools and gadgets to fight crime in Gotham City. 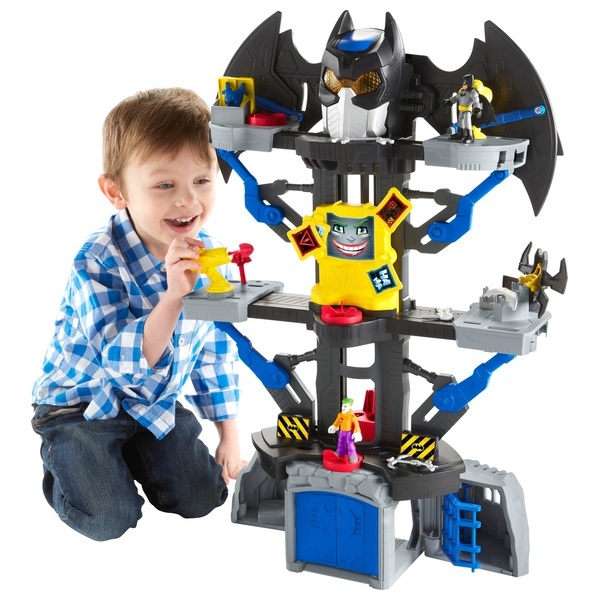 This Fisher-Price Imaginext DC Super Friends Transforming Batcave Play Set headquarters is no exception! Turn a Power Pad to transform the Batcave. The platforms, Bat computer and Batwings open and the eyes light up! Turn a second Power Pad to open the garage so Batman can speed off to thwart The Joker’s evil doings! Turn a third Power Pad to open a chest with armour that Batman can wear to protect himself from enemy fire! And no Batcave would be complete without a jail, an elevator and projectile launcher to add to the story and the adventures! With headquarters loaded with so much crime-fighting power The Joker will be no match for Batman and your young Super Hero’s imagination!